Family: wife Suzee (married in 1985), son Justin Daniel. Top horses ridden have included Cigar, Geri, Educated Risk, Wekiva Springs, Fit To Fight, Lord Avie, Candy Eclair, Meadow Star, Skip Away, and many more. Best horse ridden in 1996 was Cigar with triumphs in the Dubai World Cup, Arlington Citation Challenge, Woodward, Donn, and Massachusetts Handicaps. to win this award 3x in a row! 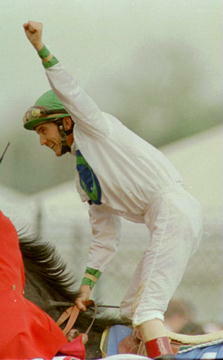 Annexed the first two runnings of the Dubai World Cup, in 1996 with Cigar and in 1997 on Singspiel. Through Oct. 19, 1997, ranked first nationally by earnings with $16,102,724. Through Oct. 19, 1997, had 251 wins from 1063 mounts. Inducted into the Racing Hall of Fame in 1995. Has won four Breeders' Cup Classics with Black Tie Affair (1991), Arcangues (1993), Concern (1994), and Cigar (1995). 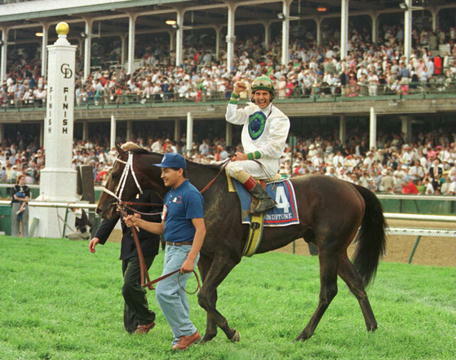 Won the 1996 Kentucky Derby aboard Grindstone and 1993 Derby aboard Sea Hero. In 1996, rode Cigar with triumphs in the Dubai World Cup, Arlington Citation Challenge, Woodward, Donn, and Massachusetts Handicaps. Former national president of the Jockeys' Guild. In 1995, set a new record for most wins in a Saratoga meet by a jockey with 45, breaking Manny Ycaza's record of 41 set in 1959. Leading rider at Saratoga, 1994-97. Also has been leading rider at Belmont Park, Tropical-at-Calder and Hawthorne, in addition to topping the Gulfstream standings in 1995, 1996. In 1996, Bailey signed with Athletes and Artists, a New York-based talent agency. Big wins in 1996 came with Geri in the Oaklawn Handicap; Wekiva Springs in the Gulfstream Park Handicap; My Flag in the Ashland Stakes, Coaching Club American Oaks, and Gazelle Handicap; Serena's Song in the Hempstead Handicap; and Sharp Cat in the Matron Stakes. Has won four of the last six Breeders' Cup Classics with Black Tie Affair (1991), Arcangues (1993), Concern (1994), and Cigar (1995); Won 1996 Breeders' Cup Juvenile aboard Boston Harbor. Also won the 1995 Breeders' Cup Juvenile Fillies with My Flag. 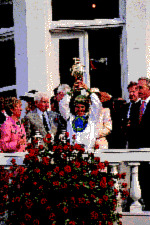 Won the 1993 Kentucky Oaks on Dispute. Won the 1991 Preakness and Belmont Stakes with Hansel and the Acorn and Mother Goose Stakes on Meadow Star. Donated the Chrysler car he received for winning the 1993 Derby to the Jockeys' Guild Disabled Fund. Awarded the 1993 Venezia Award from the New York Racing Association, which honors the late jockey Mike Venezia and is given to riders for exemplifying qualities of citizenship and sportsmanship and the 1992 George Woolf Award, chosen by the Jockeys' Guild and presented at Santa Anita. Recorded his 3,000th career win aboard Margaret E at Saratoga on Aug. 16, 1993. He won with his first mount, Fetch, at Sunland Park. He moved his tack on a permanent basis to New York in 1982, but also races in Florida in the winter. Had another typically excellent meet, placing second to Shane Sellers in the standings with 82 wins. Led all jockeys with stakes victories (11) including Gulfstream Park Handicap tally aboard Mt. Sassafras; Bailey has captured past three runnings of that event. Won six races on Feb. 10, including Gulfstream Park Breeders' Cup Handicap on Lassigny, (he holds the record for most riding victories in one day at Gulfstream Park - 7, on March 11, 1995. Four of those victories were in stakes events). Piloted Mecke to win in final career start, Jan. 12, in Mac Diarmida Handicap. Other stakes wins included Ft. Lauderdale Handicap (on Doublethebetwice), Gulfstream Park Breeders' Cup Sprint Championship (Frisco View) and Joe Namath and Sabin Handicaps (Rare Blend).